Coconut Clementine Mini Loaf Cakes – fresh, soft and moist, these mini loaf cakes are packed with citrus and coconut cream and are so simple to make. For ultimate flavor, FRESH juice is a must here! Clementines are one of our favorite foods. They are easy to peel, contain no seeds and they make the perfect snack…even on the go! We love eating them plain, but since we always have so many clementines in the fridge, I thought I’d try to create something with them as well. These mini loaf cakes turned out great! They are bursting with citrus flavor and a hint of coconut (side note: take a taste of the liquid ingredients after mixing together – it tastes like a creamsicle…soo good!). Make them for your Easter celebration or anytime you’re craving a treat! These mini loaf cakes are basically little quick breads, but with the optional icing, they really fit more in the dessert category. However, you can leave off the icing and have something suitable for snack or even breakfast. It would go great with a cup of coffee or tea. I’m warning you though, they are so good, you might find yourself wanting to eat a whole one yourself! FRESH juice is a must here! It is so much more flavorful than store-bought. So don’t even think about subbing store bought orange juice…even the ones that say freshly squeezed….it’s not the same! And if you do it anyway, just know that the citrus flavor won’t be as pronounced. I used a juicer and needed about 8 clementines. If you juice them by hand, you may need to use a few more as you likely won’t get as much juice from each one. They bake up nice and fluffy thanks to the miracle of aquafaba, the liquid from a can of chickpeas. I have tried many different egg substitutes in baking, but aquafaba is by far the best! These mini loaf cakes are so soft and moist, but hold together perfectly. And they slice easily as well. The top crust has slightly crisp edges…divine! I dusted these babies with a bit of organic powdered sugar and then drizzled the citrus glaze over the top. The first batch was eaten so fast (especially by my hubby!) that I knew we had a winner on our hands! 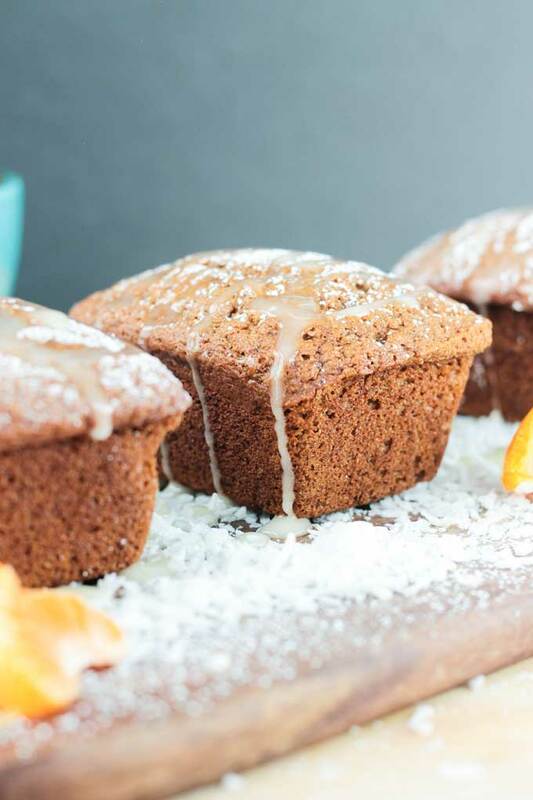 But, like I said earlier, these little citrus cakes will satisfy your craving for a little treat even without the optional icing. I hope you loved these Mini Loaf Cakes as much as we do! If you try them, please come back and leave me a message below with your feedback and star rating. Coconut Clementine Mini Loaf Cakes - fresh, soft and moist, these mini loaf cakes are packed with citrus and coconut cream and are so simple to make. For ultimate flavor, FRESH juice is a must here! 1/2 cup clementine juice (juice from about 8-12 clementines, depending on whether you use a juicer or by hand. A juicerwill extract more juice from each one than you can by hand, but either way works. TIP: squeeze a little more (2 tbsp) juice than you will need for this bread to use in the glaze). Spray a mini loaf pan lightly with cooking spray and set aside. Whisk the clementine zest, juice, coconut cream, vanilla and aquafaba in a small bowl and set aside. In a medium mixing bowl, whisk together the flour, coconut sugar, baking soda, baking powder and salt. Pour the wet ingredients over the dry and mix until just combined. Pour or spoon the batter into the prepared mini loaf pans and bake 35-40 minutes until a toothpick comes out clean. Let the loaf cakes cool in the pan for 5-10 minutes before turning them out onto a wire cooling rack to continue cooling completely. Whisk together the powdered sugar and 2 tbsp clementine juice until smooth. Drizzle over the completely cooled loaf cakes. Tip: Have leftover aquafaba? Freeze it in ice cube trays to use whenever you need it. Just defrost it fully first before using. Love Citrus? You’ll love these recipes! This looks delicious, I can’t wait to try it! How many mini loaf does this make? Hi, Amanda! It will make 6 mini loaves. Let me know how they turn out. Enjoy! Thank you! Like a creamsicle in bread form! Yummy! I love the ingredients you use for baking Jenn, they’re the ones I love using when I bake for myself! 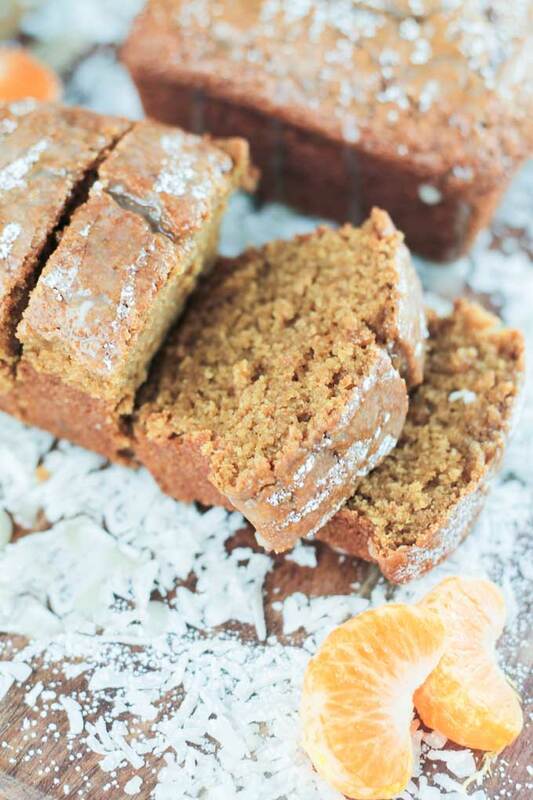 The citrus flavor will be perfect for cold season baking, too! Thank you, Alisa! Baking definitely takes some trial and error for me, but there are a few ingredients that I always come back to every time because they truly do produce the most soft, fluffy, and moist baked goods. I hope you love this! Ooh this looks lovely! Clementines are my son’s favorite fruit right now, so this is right up his alley! Yes, that lovely overnight oatmeal you made – yum!! This is like creamsicle bread! 🙂 We go through so many clementines. How cute are those?! I love the combination of coconut and clementines, it sounds lovely for spring. Thanks, Bianca! They are super fresh and should definitely brighten up a dreary spring day (like we have been having!). Yes, it really is magic! LOVE the stuff! Thank you, Leah! These look absolutely amazing Jenn! I love clementines so much. And you’re so right, fresh juice makes all the difference in the wolrd. Thanks, Lucie! Yes, fresh juice is a must!! So much more flavorful! Hope you had a great weekend! These look DELICIOUS! So moist and perfect. 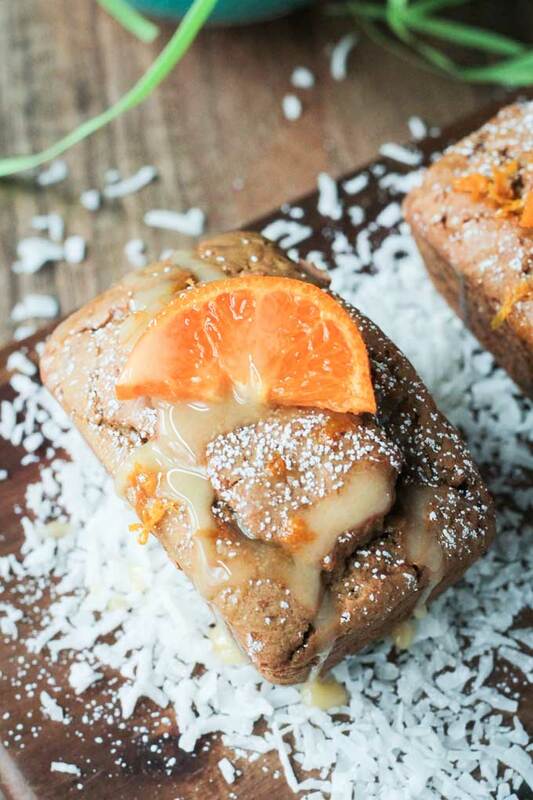 Can I put in an order with the easter bunny just to bring me a big basket of mini Coconut Clementine loaves please!? 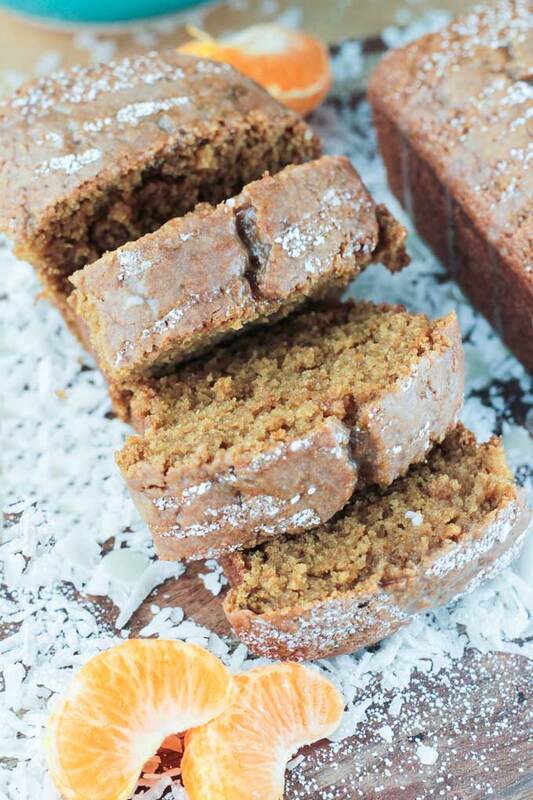 Coconut and citrus are so incredible together, and those crispy muffin…err i mean loaf tops <3 I want, I want! I might have some pull with the Easter Bunny! Let me see what I can do! 🙂 Thanks, Natalie!! I hope you do, Theresa! Thanks! Two of my favourite flavours. A must try bake. I hope you try it! Thanks, Georgina! These Mini Loaf Cakes are adorable! I’ve never tried clementine bread, but it sure sounds tasty!!! Happy weekend to you! Thank you, Tania! You should try it…it’s so good! This loaf cake sounds divine. Clementine and coconut sound like a match made in heaven. Thanks, Kate! Yes, the combo is scrumptious! 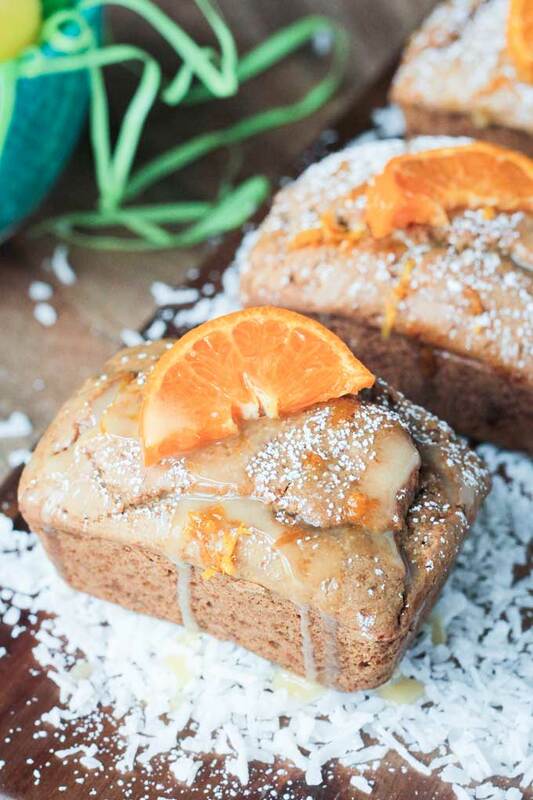 These mini loaves are adorable and sound delicious with the clementine and coconut! 🙂 They are just so cute in mini version, right? Thanks, girl! !